The 360° Camera rig is a professional rated 360° Camera Bracket for GoPro 3+ Series cameras. The 360° Camera rig is made from high quality Aluminium Alloy making it strong and extremely light. 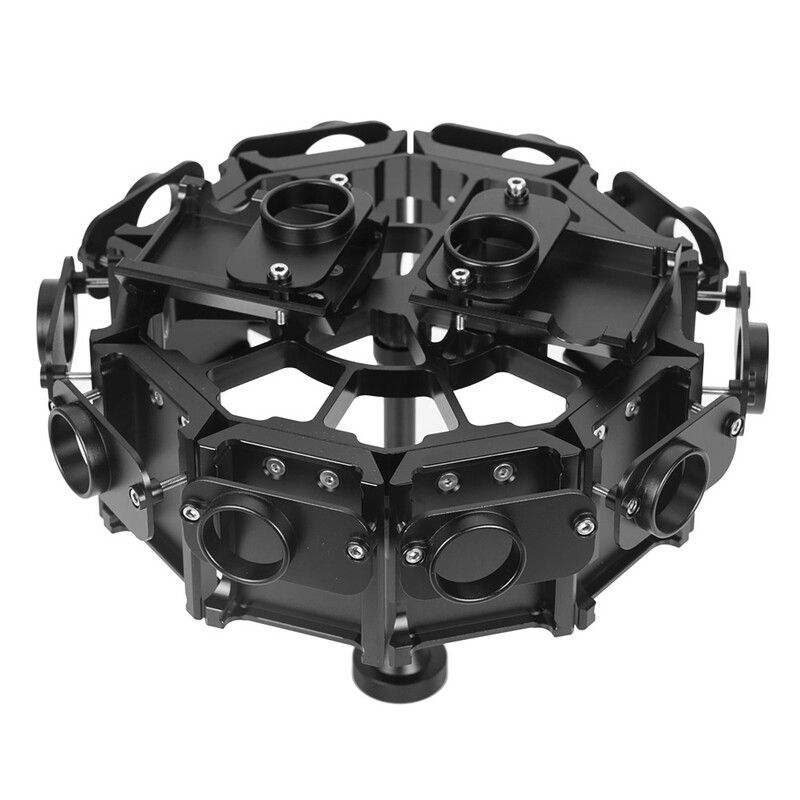 The 12 Camera Action 360° Camera rig is made for serious 3D and Virtual Reality Video Photographers and 360° Film makers and agencies. The rig works with 12 action cameras mounted inside the rig. The 12 cameras can take still images or video depending on the cameras that you use with the rigs. What can you do with the 360° Camera Rig? The 360° camera rig takes 12 action cameras like the GoPro 3+ and better action cameras. 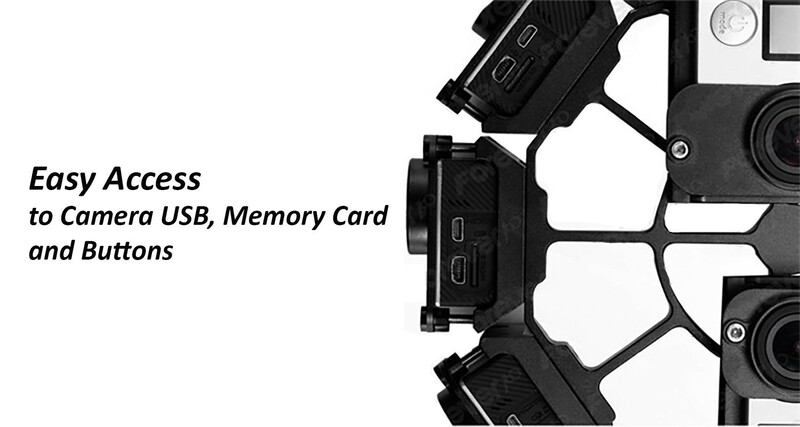 The rig is also compatible with other action cameras with the same dimensions as the GoPro 3+ series action cameras. The action cameras are spaced inside the rig for optimum 360° video filming and is also capable of taking 360° panorama images in one shot. Depending on the Action Camera’s that you use with the camera rig, you can shoot 4K 360° video at 30 FPS or 60 FPS x 12 cameras or 2K video at 30 FPS or 60 FPS x 12 cameras or less. So what can you do with the rig? Shoot 360° Panorama Still images in one shot. Shoot 360° Time laps Panorama still images in one shot. Film 360° video in one shot. Film 360° time laps video. The rig can also be mounted on a drone for 360° panorama still images as well as 360° aerial video filming. The 360° Camera rig comes with a Tripod, and extendable pole and 360° camera bracket and casing included in your purchase. 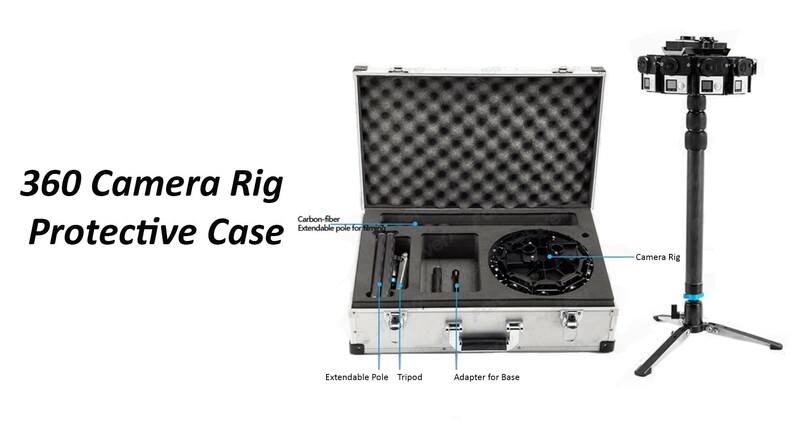 The Protective Casing have been specifically designed for the 12 Camera 360 Degree rig. The Camera Bracket, Tripod and extendable bracket fits perfectly into the case, giving your equipment a professional look, while keeping it safe and protected when not in use. Currently the Virtual Reality Company sells 360 camera rigs in South Africa and in Rand only. If you are interested in buying the 360° Camera rig system in dollars you can do so on the 3D Photographers site. The 3D Photographers company is part of our international partners and can assist you with your International purchases of 360 Degree Camera Rigs and Virtual Reality Headsets. GoPro Hero 4, GoPro Here 3 GoPro Hero 3+ and Xaiomi action cameras as well as any action camera with the same dimensions as the GoPro series of cameras. The cameras are not included with the 360° Camera Rig – You can however buy the cameras from us separately. The 360° video editing software and 360° panorama software are excluded and can be bought separately from us. The 360 Camera rig has been designed for Professional photographers looking for a high quality 360° Camera and 360° Video Camera Rig. You can take 360° Still panorama images and 360° Video with the camera rig system.